Within just a short distance are, 2 parks, a multitude of shops, a post office within one of the local shops, a pharmacy and two churches (one of which is Episcopalian and the other Church of Scotland). Nearby is the historic River Tweed from where there are lovely views of the Cheviot Hills. Victoria Lodge was constructed in the mid 19th century as a family home. However it has variously served as a local bank, a family run hotel and for its last manifestation over the past 20 years, as a retirement home. Its style is of its period and it displays a few architectural flourishes that add to its character and charm. Victoria Lodge boasts 14 well appointed and comfortable single bedrooms, many en-suite with a bath or shower. All of our staff are trained to the very highest levels and are chosen for their personal commitment to care from the outset. 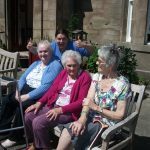 We understand that very often, it is the very small things which make a great difference in the quality of life of our elderly residents – comfortable, clean and private rooms, good food, interesting activities and things to do and of course, the availability to meet and chat with others.